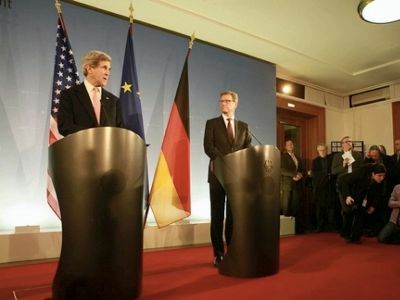 Press Conference of John Kerry and Guido Westerwelle in Berlin, February 26. During his annual State of the Union address, President Barack Obama unilaterally announced the opening of negotiations for a Transatlantic Global Trade and Investment Partnership with the European Union (12 February). A few hours later, the scoop was confirmed by a joint statement from the U.S. President and the Presidents of the European Council, Herman van Rompuy and European Commission, José Manuel Barroso. The transatlantic free trade area project was officially launched on the sidelines of negotiations for the North America Free Trade Zone (NAFTA) in 1992. Following a process of growth, Washington wanted to expand this area to the European Union. However, at the time, voices were raised in the United States to postpone this same absorption until the World Trade Organization was established and stabilized. There was fear that the two projects might collide rather than reenforce one another. The creation of a transatlantic market is only part of a larger project, including the creation of a real government with a supra-institutional transatlantic economic council, a transatlantic policy council and transatlantic parliamentary assembly. These three bodies have been created in embryo without any publicity. Their architecture harkens back to a very old project of creating a vast capitalist bloc uniting all States under Anglo-American influence. We can find traces of this in the secret clauses of the Marshall Plan and especially in the North Atlantic Treaty (Article 2). That is why no differentiation is made between the transatlantic union and the NATO economy. From this point of view, it is significant to note that, on the U.S. side, this project is not monitored by the Commerce Department but by the National Security Council. We have a glimpse of the transatlantic union’s mode of operation by observing how conflicts were resolved concerning the sharing of personal data. Europeans have very demanding standards for the protection of privacy, while American officialdom can do anything it wants using the fight against terrorism as a justification. After shuttling back and forth, Europeans are laying down as the Americans have imposed their one-way model: the Americans copy European data, while the Europeans have no access to US data. In economic matters, the idea is to repeal tariffs and non-tariff barriers, that is to say local standards that render certain imports impossible. Washington wants to quietly sell its GMOs in Europe, its chickens treated with chlorine, and its hormone-laced beef. It wants to mine data from Facebook and Google etc. without being hampered by privacy protections. To this long-term strategy are added medium term tactics. In 2009-2010, Barack Obama had set up a Committee of economic advisers chaired by Christina Romer, historian. This specialist of the Great Depression of 1929, had developed the idea that the only solution to the current crisis in the United States would be to cause a shift of European capital to Wall Street. To this end, Washington has barred most non-Anglo-Saxon tax havens, then played with the euro. Capitalists in search of stability encountered difficulties in transferring their money to the United States, however. The NATO economy will make it easier. The USA will save their economy by attracting European capital, thus to the detriment of Europeans. Beyond the uneven nature of this project and the trap it represents in the immediate future, the most important thing is that the interests of the United States and those of the European Union are in reality divergent. The United States and the United Kingdom are maritime powers who have a historical interest in transatlantic trade. It was even their goal expressed in the Atlantic Charter during the Second World War. In contrast, continental Europeans have common interests with Russia, especially in energy. By continuing to obey Washington as during the Cold War, Brussels does a disservice to Europeans. This entry was posted on March 9, 2013 at 10:08 pm and is filed under Europe, NATO, Thierry Meyssan, USA. You can follow any responses to this entry through the RSS 2.0 feed. You can leave a response, or trackback from your own site.